The original course – designed by Robert Trent Jones, Sr. and opened in 1995 – has been completely overhauled, with an investment in quality that is above and beyond the realms of most ‘ordinary’ golf projects. 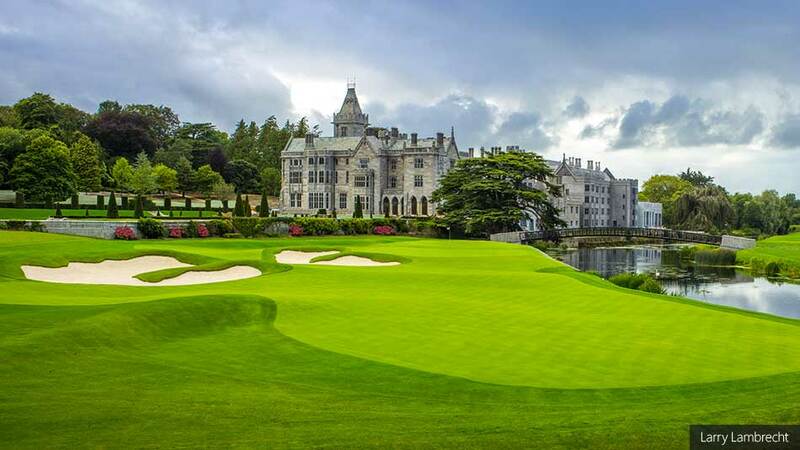 Adare Manor is located in the small town of Adare, a 30-minute drive from Limerick, Ireland. The manor itself is an imposing grey limestone-walled gothic-style building, completed in the 1860s for the Earl of Dunraven. It was built as a ‘calendar’ house, with 365 windows, representing days of the year, 52 chimneys, one for each week, and four towers, for the seasons. It passed through generations of Dunravens until the 1980s, when the burden of upkeep became too great. The property was sold and converted into a resort, the golf course being added a few years later. In 2015, Irish businessman J.P. McManus, well known as a racehorse owner, bought the property, and set about a substantial renovation of the house and grounds. To realise his vision for the golf course, he returned to the Fazio Design team that helped him create two courses at the luxury Sandy Lane resort he co-owns in Barbados. “The vision was a manicured, clean, very playable golf course. There was a request for basically no rough, all of the course to be mown down to a level where you could see the back of the ball, and play a round of golf with no lost balls – that was the starting point for the conversation,” says Tom Marzolf, senior design associate at Fazio Design, who relocated from the United States to Ireland for more than a year while the work was in progress. It took an impressive group of collaborators to turn McManus’s vision and Fazio Design’s plans into reality. Agronomic consultancy from Turfgrass Ireland, hydromulch and soil amendments from Profile Products, seed from Tee-2-Green, turf from Tillers Turf, aeration systems from SubAir, bunker lining by Capillary Concrete, scanning by Greenscan 3D, a new irrigation system from Toro and installation by MJ Abbott. Tour professionals including Padraig Harrington and Paul McGinley were invited to the course by the McManus family to share their observations with Fazio Design. Heading this cast list was golf course construction firm Atlantic Golf Construction, which has earned a reputation as experts in mobilising large teams quickly and effectively, producing work of the highest standard within aggressive timescales. Under the direction of Anthony Bennett and management of Russell Stanworth, and working alongside golf course superintendent Alan MacDonnell, the Atlantic team comprised, at peak times, a crew in excess of 150. The course was completely recontoured and now has over 135 acres of maintained turf – MacDonnell, operating from a new state-of-the-art greenkeeping compound, is working on boosting his team to 50 in time for a spring 2018 opening. “There was a fluidity to the project too,” continues Bennett. “It began as a smaller undertaking, but once the owners began to see the impact of the Fazio team’s design, they extended their vision.” This changing dynamic brought further pressure to Bennett’s team, but a ‘can-do’ approach meant the work continued apace. With so much focus on the infrastructure of the site – spectator flow, road access, communications – one might expect this to overshadow the golf experience. But a huge success of the design is that it is all expertly blended or hidden away from the everyday golfer, the resort guest, who could play the new course oblivious to the fact that a primary focus of the project was preparing the site to stage tournament golf. “Tee to green, shot to shot, this is a championship golf course, first and foremost,” says Marzolf. The routing of the golf course (see page 19) has not changed. But within each hole corridor, virtually everything has. The ground was totally regraded, both for the strategy of golf holes and to optimise spectator access, and engineered to maximise the quality and resilience of the playing surfaces, providing firm and fast conditions. The site is low lying with most holes playing at a similar elevation, so getting it to drain effectively had always been a challenge, particularly given Ireland’s propensity for rain. Now, with a six-inch sandcap and extensive drainage throughout the property, the surfaces are pristine and always firm. “It’s going to be one of the driest rounds of golf you’ll play in your life. You could walk to the lowest spot on the property and jump up and down and it’s now firm, sandy turf,” says Marzolf. The greens are so immaculately presented that you almost feel you should remove your shoes before stepping onto them. They are seeded with Pure Distinction, and the light hum of SubAir reminds you that the perfection on the surface is the result of the sophisticated engineering below it. Areas of the site that had become overgrown have been cleared and non-native species such as laurels have been removed, meaning there is good visibility, plus movement of air and sunlight, throughout the site, which not only enhances the quality of playing surfaces but also opens up vistas throughout the course – the manor is now visible from most holes. These changes mean the golf course is extremely playable from the tee – the only lost balls will be those that find a water hazard. This will make for the experience enjoyable for resort guests, but don’t be fooled into thinking scoring will be easy. 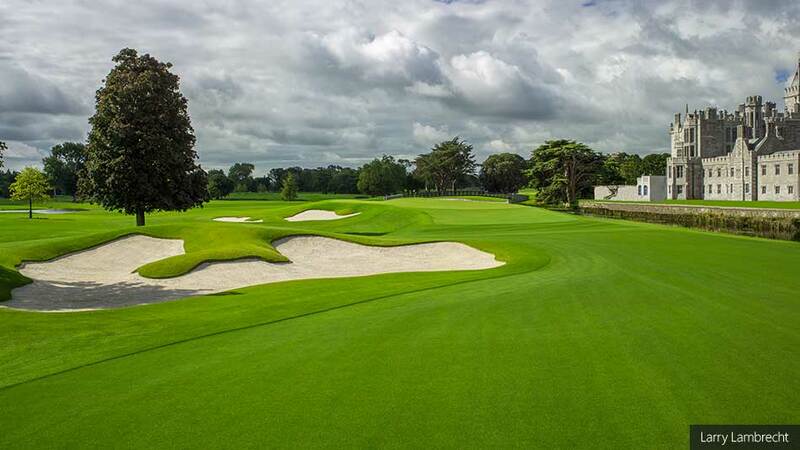 Adare Manor’s primary defence is its fearsome greens. They are generally raised high above their surrounds, often way above head height. If you fail to reach or hold the surface with your approach, you’ll need an expert short game to get the ball close to the hole. Relative to their profile above the surrounds, the surface contour seems quite modest. But that is a visual deception – once on the green the challenge will feel like it’s only just beginning, particularly given the guarantee of quick surfaces. Large sweeping plateaus form greens-within-the-green, and two-putting will be a great achievement for anything beyond a few feet from the hole. Comparisons with Augusta are inevitable. There isn’t considerable elevation change on the property, but the quality of the surfaces, the challenge presented by the greens and the amoeba-shaped white sand bunkers will have most visiting golfers thinking of Georgia. 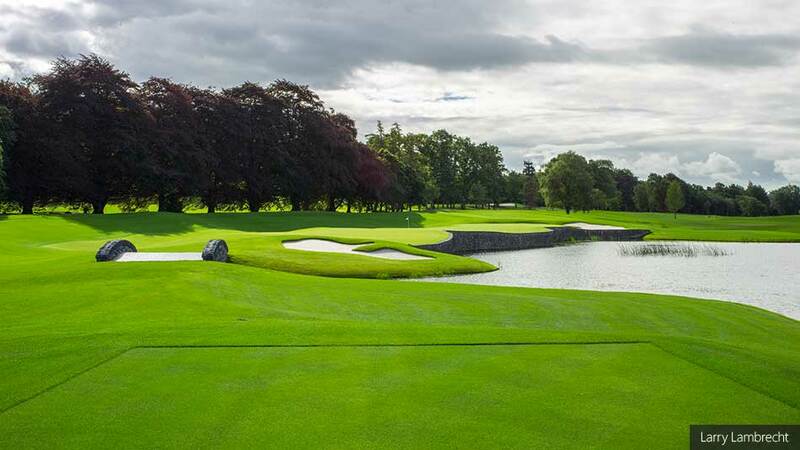 Appropriately for a course which has been designed to host the highest level of tournament golf, the most exciting stretch of holes are the final five. 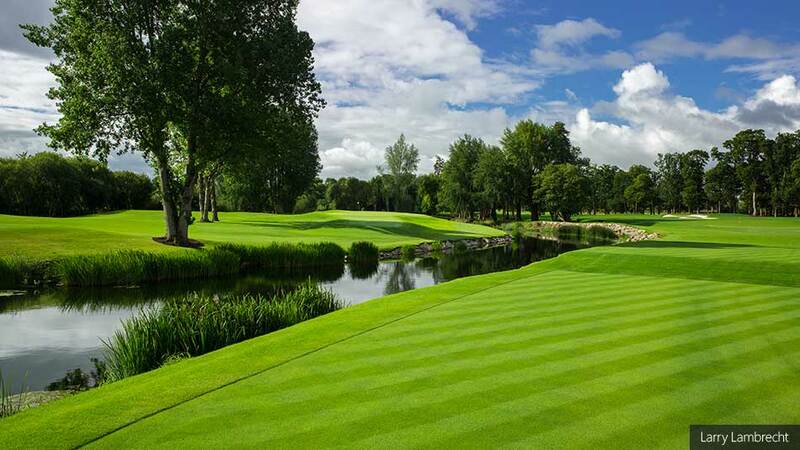 The fourteenth sees players emerge from the wooded higher ground of the previous two holes to a par four with a green that juts into a lake on the border of the property, with the remains of the thirteenth century Desmond Castle as a backdrop. The short, maybe driveable, par four fifteenth is dominated by the River Maigue that bisects the golf course, with the manor on the opposite bank. It will require extreme bravery and accuracy to follow the direct line to the green, while a large bunker and deep swale will bring indecision into the various layup options. The sixteenth plays over a lake to a green that is a massive 60 metres in length, the angle of which opens as you move up each of the tee boxes that curve around the water’s edge. The seventeenth moves back inside the treeline before a grandstand closing par five brings you back towards the manor, where the river will need to be crossed to reach the tiered final putting surface on the opposite bank. It is workmanship of the highest calibre. All this comes at a cost, of course. And the golf course represents just a fraction of the overall investment in the resort, with the manor having been extended and completely refurbished to an impeccably high standard. A positive return may arise, as the resort is clearly aimed at the very highest end of the market. But there’s a strong sense that the owner was otherwise driven. It’s hard to imagine Adare Manor having been more glorious at any point in its past, and its future was in doubt. But now the resort will not only provide a source of great pride and influx of visitors to the local community, but it will be a livelihood for hundreds working both at the manor and within a supply chain that extends throughout the country. It is some legacy.